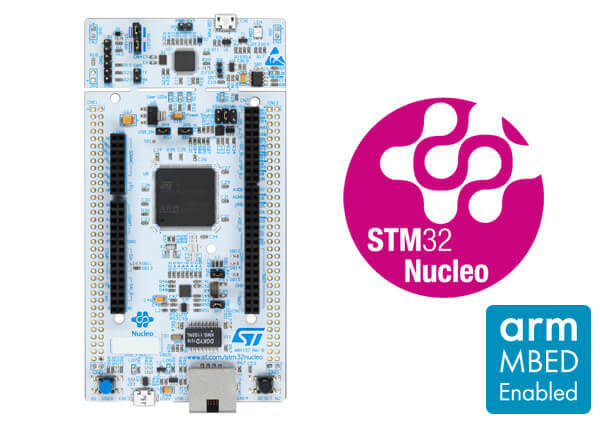 The STM32 Nucleo-144 boards offer combinations of performance and power that provide an affordable and flexible way for users to build prototypes and try out new concepts. For compatible boards, the SMPS significantly reduces power consumption in Run mode. The Arduino-compatible ST Zio connector expands functionality of the Nucleo open development platform, with a wide choice of specialized Arduino* Uno V3 shields. Flexible power-supply options: ST-LINK USB VBUS or external sources. On-board ST-LINK/V2-1 debugger/programmer with USB re-enumeration capability: mass storage, virtual COM port and debug port. More information about the board can be found at the Nucleo F756ZG website. Note. The Arduino Uno v3 specified SPI device conflicts with the on-board ETH device on pin PA7. Nucleo F756ZG System Clock could be driven by an internal or external oscillator, as well as the main PLL clock. By default, the System clock is driven by the PLL clock at 72MHz, driven by an 8MHz high-speed external clock. Nucleo F756ZG board has 4 UARTs and 4 USARTs. The Zephyr console output is assigned to UART3. Default settings are 115200 8N1. Applications for the nucleo_f756zg board configuration can be built and flashed in the usual way (see Build an Application and Run an Application for more details). Nucleo F756ZG board includes an ST-LINK/V2-1 embedded debug tool interface. Run a serial host program to connect with your Nucleo board.